Accessories for men can be a little tricky. For women, it is very easy to match accessories to different outfits, but for men sometimes it doesn’t come quite as naturally. If you’re a man who is a little uncomfortable with accessorizing, then breathe a sigh of relief as this guide is here to make sure you don’t make any crucial mistakes when getting ready for a wedding. I know what you maybe be thinking – it’s hard enough to tie a tie knot as it is, let alone having to consider the positioning of where it will end! However, this is a really easy trick to make sure your tie looks perfect, and to ensure you look like a man who knows what he’s doing. Your belt is a good guidance point as the widest part of the tie should be placed at the top of your belt and the tip should extend slightly below. If you’re wearing metal jewelry like cufflinks, a tie clip or a watch then you should ensure that they are all made of either silver or gold. Mixing the two colors together leaves for a mismatched look and it seems as though you haven’t put much thought into your look. Although we just spoke about the importance of matching metals, we are about to contradict ourselves here as certain accessories should not match at all! Two examples of this are your pocket square and tie. Instead of buying a 2-pack of the same pattern, try to find a color in one that is channeled in another. If this all sounds a little complicated then I’ll give you an example. 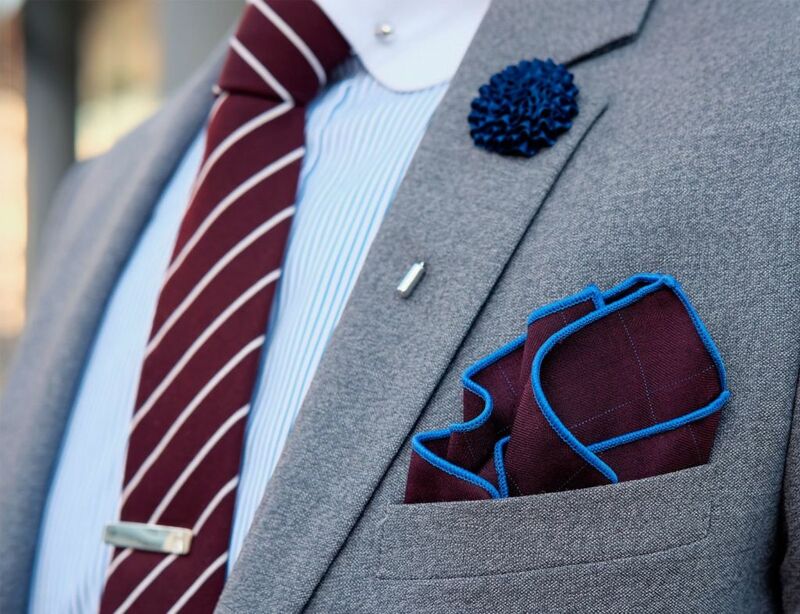 If you are wearing a floral pocket square with a burgundy, white and grey pattern, then you could get a burgundy block colored tie. Simple! Suspenders, or braces as they’re often called, are a substitute for a belt so the two should never be worn together. Trousers are supposed to have an attachment on the inside so that suspenders can be worn, so make sure to check yours do before the day of the wedding so your outfit plans aren’t ruined. Simple pieces of jewelry can look really smart when worn in the correct way. However, wearing too much jewelry is a sure fire way to ensure your outfit looks messy and uncoordinated. The size of your jewelry is also important and due to the formality of a wedding, understated and smaller pieces tend to work better than larger ones. Also, consider your body shape and frame, large accessories can leave you looking lopsided. One example of this is earrings for men, if you are a man with a small face, then a large pair of studs is not going to look subtle. Furthermore, if you are a man with a round face then a round pair of earrings isn’t going to look right – you should instead opt for a square shaped pair.